On 2 January 2002, Crompton Greaves had a market cap of Rs 115 crore and its stock was at Rs 1.80. Today, on 29th Dec'14 the stock price is trading at Rs 193 and the company's market cap is above Rs 12,000 crore. Rs 1 lakh invested Crompton Greaves in Jan 2002 is more than Rs. 1 Crores today. It has been one of the wealth creators in the Indian stock market which has given almost 50 percent annualized return to investors over the last 13 years. Lets take another example of little known company Mayur Uniquoters which is our 8-Bagger stock. We recommended this stock 3 years back at price of Rs. 56 (adjusted price after 2 bonus issues and stock split in last 2 years, actual recommended price was Rs. 448) and today it’s at Rs. 477 giving absolute returns of 753%. You might be surprised to know that Mayur Uniquoter is a 159-Bagger stock for investors who invested in it 6 years back. Investment of Rs. 1 lakh in Mayur Uniquoters in Jan 2009 is valued at Rs. 1 Crores and 59 lakhs today. Mind boggling, isn't it? It's a fact! Company has posted strong growth YoY and rewarded share holders in big way, Company was trading at Rs. 3 (bonus / split adjusted price) with market cap of merely 13 crores in Jan 2009, today market cap of the company is 2,067 crores. If these factors scare you but you still want to gain from the upside potential of such stocks, Saral Gyan Hidden Gems is an ideal choice for you. It’s a fact that 24 Hidden Gems out of 36 released by our equity analysts in last 4 years have given more than 100% returns. Saral Gyan team do take care of above concerns by doing in-depth research and analysis of small cap companies before releasing Hidden Gems research reports with buy recommendation. Its sincere efforts, dedication and passion of our equity analysts that 24 out of 36 Hidden Gems released by us during last 4 years have given more than 100% returns to our members. In fact 14 out of these 24 stocks are giving returns in the range of 200% to 1000%. We are glad to share with our readers that 3 Hidden Gems out of 11 released in 2014 have already achieved their target price giving returns of more than 100% to our members. Hidden Gems stocks - 2014 average returns as on date is 64.6% compared to small cap index returns of 25.7%, hence outperforming small cap index by 38.9%. If you have patience and want to add extra power in your portfolio, start investing some portion of your savings in fundamentally strong small companies - Hidden Gems. The stocks we reveal through Hidden Gems & Value Picks are companies that are either under-researched or not covered by other stock brokers and research firms. We keep on updating our subscribers on our past recommendation suggesting them whether to hold / buy or sell stocks on the basis of company's performance and future outlook. 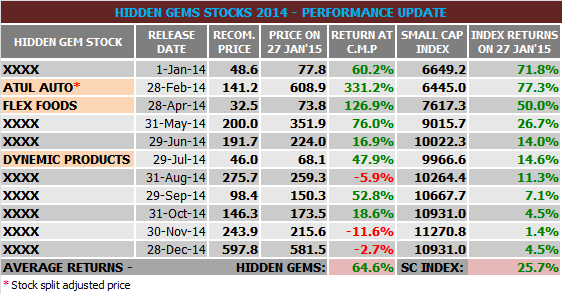 Note: Hidden Gem and Value Pick stock of Jan'15 will be released during this weekend of the month.